Spiritual practices are aimed at helping us understand our connectedness, to sense our oneness. The feeling of presence is very real for many of us. It is a feeling which sustains me, and fills me with appreciation for all that is my life. We do not have to fit ourselves to someone's prescribed discipline in order to feel we are being spiritual. Spirituality is with us always, and our individual situations will define the tools we choose to use, if we take the time to listen to ourselves and know our joys and yearnings, whether for quiet or a walk in beauty, for exercise or music, for sunsets or sunrises, for strenuous activity or the hand in ours, for the glance of a child, for effort or work that is meaningful, for the creative task or the work of community, or for the moments of appreciation which are available to us anytime and anywhere. My daily spiritual practice is to balance. A major part of that practice involves balancing the busy, taking-for-granted moments of the day with moments to pause and appreciate what is before me in my life. I probably wouldn't even have considered this a spiritual practice, except that I've been learning to redefine the meaning of what is spiritual, and to ponder for myself what is important in my faith. If we have family and work, integrating a traditional spiritual practice into our daily lives is a real challenge. Try meditating with a baby in the next room! I know there are others more disciplined than I, but I have had years when I was able to be disciplined. I used to keep a journal in early college, but rarely write that way anymore. I was taught to meditate one summer when I was out of balance in my life. For a year I meditated twice each day, to great benefit of spirit. But slowly, I let it slide, and am trying to get myself to make room for it once again. I studied aikido for a year and a half, but moved, and my new teacher didn't blend the physical with the spiritual in the way my original teacher had. I am a poet, have written poetry for most of my life, learning from the insights I discover through such a process, yet never in a regular exercise. The latest practice I engaged in was to walk for twenty minutes three times a week, for both my physical and my mental health, and I kept that up for two years until I went back to teaching full-time. Last year I moved to Tucson, and have spent a year wondering when I would get back to walking, or would I join a Zen meditation group, or what. Even though I haven't kept up these practices regularly, I have learned from them, been shaped by them. They are tools, not ends. They help us learn to slow down, to pay attention, to focus, or to empty. We can practice spirituality in our daily lives, in our daily activities, by remembering to pause, pay attention, and feel appreciation for what is before us. 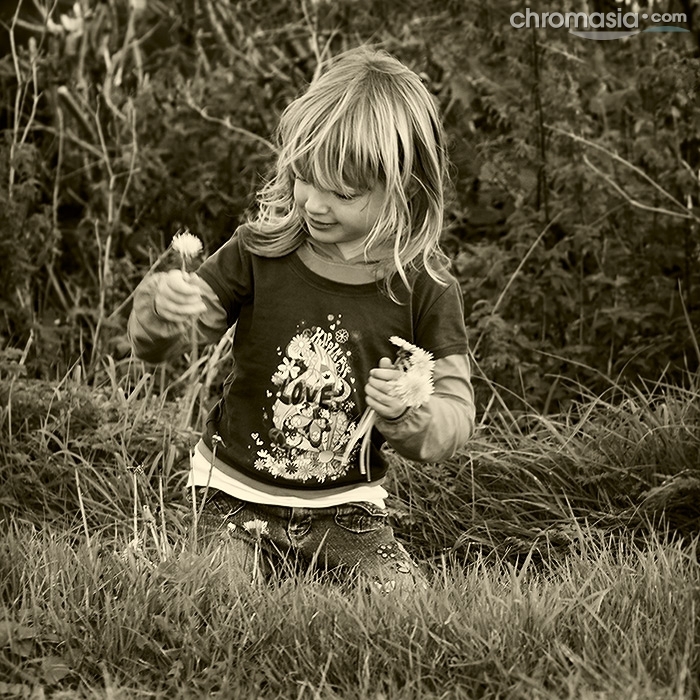 Paying attention means using all of our senses in being in the world and in the moment. Stop a moment. Feel the chair in which you are sitting. Notice the temperature around you. Listen for the sounds of your background symphony. Breathe. Appreciate the colors of your clothes, your skin, the sky, or the ceiling. Focus on appreciating the peace out of which you have found the time to read these words. Remember the feeling of oneness with creation, and try to bring that back into being. This practice only takes a few moments and is not bound by place or time or ritual. Out of our busyness, we are called back into balance, back into ourselves and the silence of present being. But it is not just back into ourselves to which we are called; it is also to the awareness of the continuous presence of the environment around us and within us. We are called to remember our relationships and our dependencies. We are called to once again feel the oneness which sustains our being in balance with creation, and to do so with wonder and appreciation. There are times, I will admit, when it is harder to recall that sense of presence and connection. When that happens, I usually realize that I've gotten somewhat out of touch with my body, and so I spend a little more time putting myself behind my eyes, so to speak. I don't just see; I see broadly, to the edges of my sockets, my brows and lashes. I put myself back into my hands and arms, feel my feet and the length of my body. I find my heartbeat, and my breath. As I become aware once again of the vessel which is me, the sense of awareness of presence grows, expands into the space around me, connecting me to all that I see and hear and touch and feel and taste. Balance returns. The world is full of wonder, if we but stop and pay attention. It is there, waiting to feed us, even in very difficult situations. The day is made up of moments, and each moment can be an eternity of peace to those experiencing pain or grief. They are like blessings, and we count them, one by one throughout the day. They help us keep our balance. Pause for those moments every so often to listen and to look, to feel and to smell, to taste and to appreciate, to feel thankful for the beauty which is around us even in the smallest grains of red dirt and in the grandest blue of sky. The mundane world is a source of deep spirituality. Notice it, appreciate it, for you are it and it is you. Rev. Susan Manker-Seale has served UU congregations in San Rafael, CA (1986-88), Glendale, AZ (1989-95), Tucson, AZ (1996-2010), and Flagstaff, AZ (2012-14). Describe a time when you did something that created a strong sense of balance in your life. (What did you do? 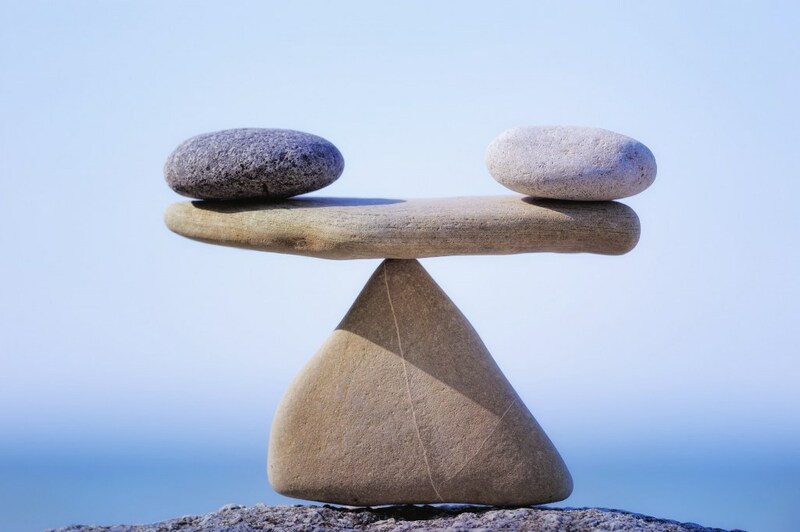 What did balancing feel like for you?) Then take a self-assessment: How balanced would you say you are right now? How do you feel about that? Previous Practice of the Week: "Protect Your Brain"
Washing your hands is a spiritual discipline. Seriously. Hand washing reduces colds and flu. Colds and flu activate the immune system, which releases chemicals throughout the body. These chemicals can linger in the brain affecting your spirit. Your brain controls your other bodily systems, and it's the basis for your thoughts and feelings, joys and sorrows. No question, it is the most important organ in your body. Small changes in its neurochemistry can lead to big changes in your mood, resilience, memory, concentration, thoughts, feelings, and desires. So it's vital to protect it from negative factors like toxins, inflammation, and stress. If you take good care of your brain, it will take good care of you. Avoid toxins. Besides the obvious actions -- like don't sniff glue, and stand upwind when pumping gas -- be careful about alcohol, which works by depriving brain cells of oxygen: that buzz is the feeling of neurons drowning. Minimize inflammation. When your immune system activates to deal with an infection or allergen, it sends chemical messengers called cytokines throughout your body. Unfortunately, cytokines can linger in your brain, leading to a slump in mood and even depression (Maier and Watkins 1998; Schiepers, Wichers, and Maes 2005). So take practical steps to reduce colds and flu, such as washing your hands often, and avoid any foods that set off your immune system. For example, many people have inflammatory reactions to gluten grains (e.g., wheat, oats, rye) and/or dairy products; it's not surprising, since these foods were introduced just 10,000 years ago, a tiny moment in the 200 million-year evolution of the mammalian, primate, and human diet. You don't need overt symptoms of allergies for a medical lab blood test to show that gluten or dairy foods aren't good for you. On your own, try going to zero with both these food groups for two weeks and see if you notice a difference in your mental or physical health; if you do, keep staying away from them: I do myself, and there are plenty of delicious alternatives. Get regular exercise, which promotes the growth of new neural structures, including via the birth of new brain cells. Describe a time when you noticed toxins, inflammation, or stress having a lingering negative effect on your sense of well-being. 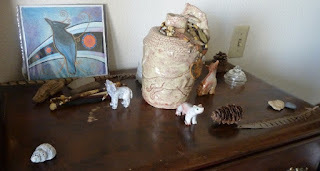 Previous Practice of the Week: "Create a Home Altar"
When I moved from my home in Vermont to California to go to seminary, two white-veined, black rocks common to Lake Champlain traveled with me. There, I placed them on my windowsill facing the San Francisco Bay. A friend from home came to visit. After she left I discovered she had rear-ranged the rocks, placing the smaller of the two on the bigger one. They now looked like a seal perched on a rock. Suddenly, my whole perspective of leaving home changed: If my Vermont rocks could adapt to California, so could I. Today these two sacred black rocks sit upon my home altar. I have always been a collector of sacred objects. 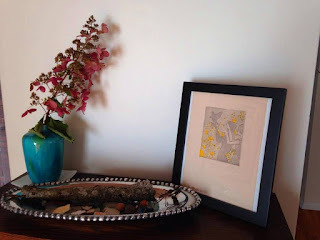 For many years, my rocks and feathers and cherished photos sat in various corners of homes I've lived in — on my dresser, on a mantle, a book shelf, and windowsills. I first discovered the powerful impact that comes from creating a more intentional center of spiritual focus when I participated in a program on women's spirituality called Cakes for the Queen of Heaven. Each week, the women in the group brought objects that held special meaning — gemstones, rocks, painted eggs, photos, jewelry, shells, candleholders, and glass and ceramic art — that we used to create an altar in the center of our worship circle. After the program ended, we continued to meet once a month at my home to celebrate the cycle of the seasons and rites of passage. 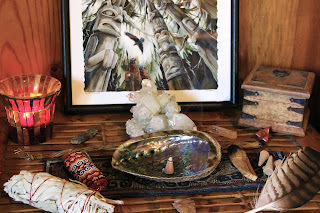 A round coffee table served as the base of our altar, on which we placed our sacred objects. With our altar as the central focus, we each brought a presence to the circle that was intentional, creative, harmonious, energizing, truthful, joyful, and powerful. One day I walked with a friend along the Pacific Coast. We were looking for sand dollars to take to her new home in Utah. We spotted a sand shark washed up on the beach. Discovering it was alive, we found a piece of driftwood, slid it under the shark, and carried it between us knee deep into the ocean. We waited for the next wave, and released it. I felt exhilarated as it swam away. Continuing our search for sand dollars, my attention wandered to rocks. I picked up a gray rock with a strange bump on it and turned it over. In my hand lay a perfectly fossilized sand dollar. This 10,000-year-old stone now sits upon my home altar. Altars hold a central place in the history of many cultures and religions. 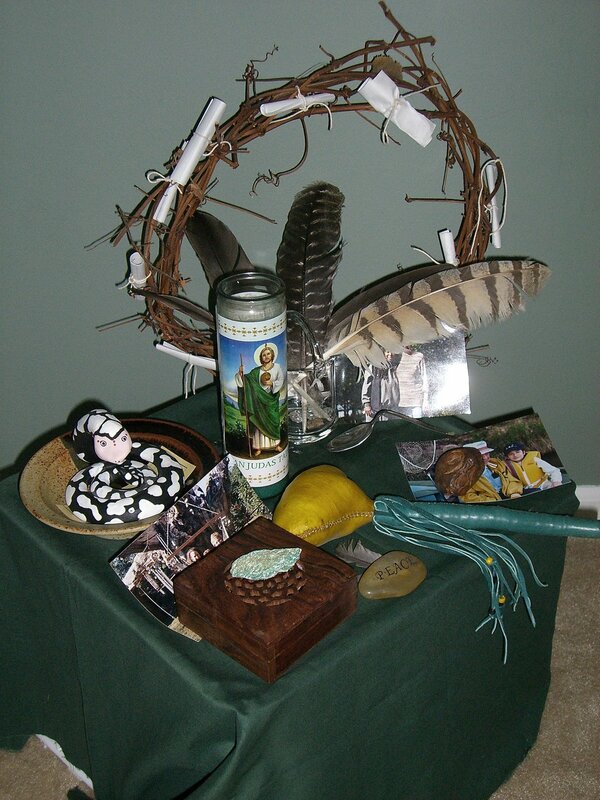 When an altar is used, it is regarded as a place of contact with the deity, set apart as holy. It might be as simple as a bowl on a stone or a mat. It might be a table made of clay or wood or elaborate bronze or gold. The Greeks had numerous altars: one in the home for family use, a city altar on which fire continually burned, and a temple altar dedicated to a god. The Hopi constructed sand altars to resemble animals, each symbolizing certain sacred characteristics and relationships with the spirit. 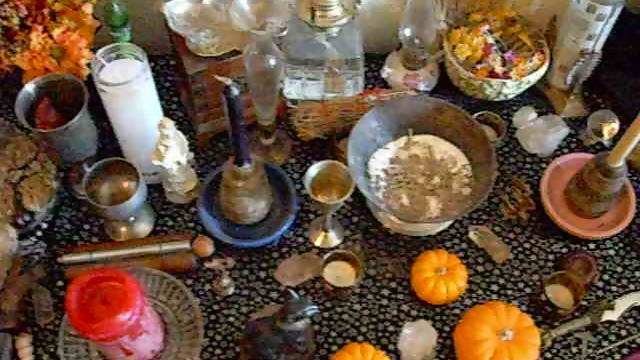 In Central America every home had its personal altar. In the evolution of Christianity, increasing ceremony surrounded the eucharistic table after the death of Christ and the altar was moved from the people into the sanctuary. I spent ten days at a writing seminar at Ghost Ranch in New Mexico where the sky is an ocean of blue and the earth a blanket of red mountain dust. There is no mercy to this geography. To survive in the desert, you must pay attention. Sitting on a rock, I scooped up a handful of earth, mindful that this was once the floor of the ocean, mindful of the ancient feet that had once trod this way. Today, this handful of New Mexico earth sits upon my home altar. I discovered that between the celebrations of my women's group I wanted to keep the altar intact. In fact, I wanted to create my own altar. I chose a quiet corner in my office as a gathering place for my own sacred objects. An oval coffee table offered a suitable base. A large, round, flat basket with handles, on which to place my objects, would make my altar portable. I have long been fascinated with the medicine wheel, an ancient symbol used by almost all of the Native people of North and South America to represent the circle of life. The medicine wheel expresses relationships in sets of four: the four directions, races, elements, seasons, stages of life, and aspects of our nature. With the medicine wheel as a guide, I gathered my sacred objects and placed them on the basket to create a center of spiritual focus. 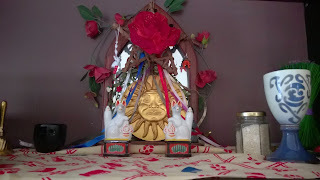 I placed a candle on a piece of quilted fabric in the center of my altar. This candle represents the center (according to the medicine wheel, the transcendent and immanent, Great Spirit and Mother Earth, the Goddess). In the direction of the east (the direction of spring, air, birth, and dawn) I put my collection of feathers in a straw basket and a yellow candle in a glass holder. In the direction of the south (summer, fire, youth, midday) I put the red New Mexico dirt in a clay pot and a red candle. In the direction of the west (autumn, water, adulthood, twilight) I put the fossilized sand dollar, a river rock in water in a small ceramic bowl made by my daughter, and a black candle. 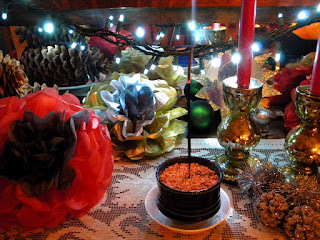 In the direction of the north (winter, earth, old age, midnight) I put my black Vermont rocks and a white candle. Above the altar hang photographs and paintings of special places and handmade symbols of my spiritual journey. Below it, I keep my daily meditation book and my journal for the time I spend there in reflection. All the parts of my center of focus are moveable and changeable. 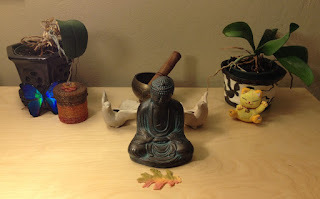 As I continue on my spiritual journey, I add new objects that are sacred to me and give away others. I tend my altar. In the direction of the south, I have added a photo of a friend far away who needs healing. In the north, I put photos of my wise grandmother Agnes and two of her sisters. Next to them sits a crystal belonging to my friend Sharon. 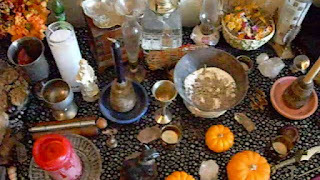 When she died, her husband invited each of her women friends to take something from her personal altar. It was very hard to do, for the altar held a lot of power and integrity that was connected to her. But now her crystal is part of my altar. 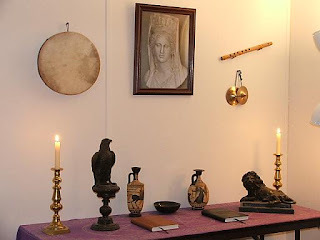 My personal home altar is my place to pray, meditate, read, and write in a setting that connects me to the sacred. The world is so temporal that we have to intentionally make it more sacred. I know that I will be awake when I am in the presence of my altar. Its individual objects are sacred to me because of their natural beauty and form, and because of the meanings they hold, the parts of my spiritual journey they evoke. The rock with the fossilized sand dollar was made sacred by the feeling of synchronicity I had when I discovered it. I felt a connection to the shark and the sea and my friend that I experience again whenever I see or hold this rock. My altar is a touchstone in my life. Though I try to bring awareness to every aspect of my life, from doing the dishes to attending worship, the presence of my personal home altar connects me to the sacredness of life. 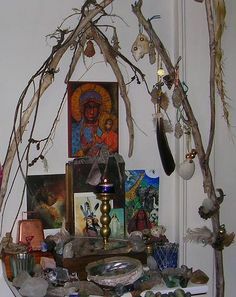 The sacred objects on my altar call forth the sacred in me that connects with the sacred in nature and with the sacred in worship. It beckons me to pause, to reflect and to regain my sense of balance and wholeness. 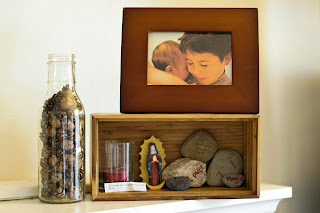 My altar can go anywhere with me — on a trip, to a new home, to the hospital or a nursing home. And if sustaining a home altar remains as a personal spiritual practice, when I die, it can be buried with me or dispersed to my family and friends. 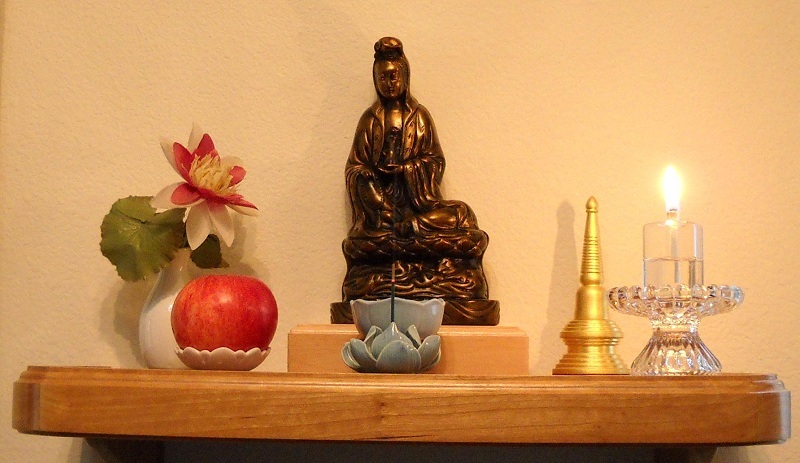 Would creating and tending a home altar be a meaningful spiritual practice for you? Ask yourself this: am I a collector? Do I collect sea glass or shells, rocks or feathers? Driftwood? Are there objects that hold meaning for me, that reflect my connection with nature, relationships with other people, a connection to ancient traditions? Do I like to celebrate? Do I decorate my home for different seasons and holidays? Do I like to keep photos or cards in a place where I can see them? Am I creative? Do I enjoy arranging flowers in a special vase or covering a table or bureau with a colorful cloth? Do I have a quiet space where I enjoy sitting quietly some time during the day or evening — perhaps to sip a cup of tea, read a daily meditation, or simply just to sit? Do I sit at a table near a window, on a porch, or in a cozy chair where I can put up my feet? Whether we do so intentionally or not, each of us creates an environment in our home that nurtures us through our senses — sight, sound, touch, taste, and scent. An altar can nurture you through your senses, add meaning and beauty to your life, remind you that the holy is present wherever we call home. Your home altar should reflect your personal spiritual story. It doesn't matter whether it consists of a candle, a bell, and a statue of Buddha on a piece of cloth, or a bowl of sea glass and a photo on linen crocheted by your grandmother. It doesn't matter if you pay attention to the directions or just gather your own precious objects and mementos. What is important is who you are in the presence of your personal altar. For there, you have created a place where you are invited to recognize the sacredness of life, where you are invited to "wake up!" and be whole. Rev. Nichols is a Unitarian Universalist minister, retired since 2010. She served the First Universalist Church in Auburn, ME (1988-99), and the Champlain Valley UU Society in Middlebury, VT (1999-2010). Previous Practice of the Week: "Nourish Your Brain"